With undeniable style in everything it does, The World Ends With You -Final Remix- fits beautifully as a handheld on Switch in its updated form. While its DS trailers make it already look good enough thanks to choice of artstyle, the fresh coat of paint on Switch makes the experience play out smoothly with its comic book-esque visuals that pop off the screen, with its own control schemes that make playing with the Switch’s touchscreen a quick and fun battle experience. If you’re open to playing with different control styles and experiencing a story with colourful style and dialogue on the go, The World Ends With You -Final Remix- is a great game to discover in its Switch version for new players like myself and for those who want to see the additions to its world. 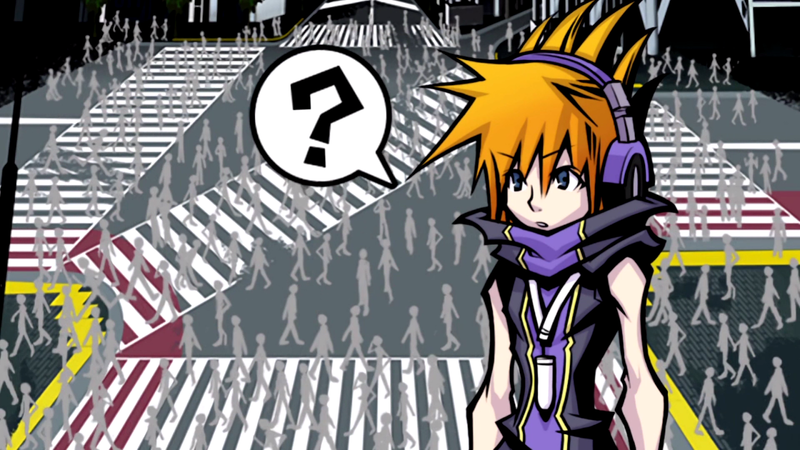 In the colourful city of Shibuya, The World Ends With You follows protagonist Neku who finds himself suddenly in an alternative version of the city with a Player Pin in hand. This Player Pin signifies he’s been entered into “The Reapers’ Game”, a seven day game where players complete missions given to them by people called Reapers and if they don’t complete them, they face being erased. To be able to fight monsters called Noise, despite his general dislike of people, he’s forced to partner up with another player to be able to fight and with his new partner and the interesting people he meets on the way, he continues in this underground version of Shibuya to find out how he got there and to try and win the game before facing erasure. The backdrop of this interesting setup is Tetsuya Nomura’s vivid take on Shibuya, Japan, which you wouldn’t realise was on DS when first looking at it thanks to its visual upgrade for Switch and its wonderful comic book-esque animation style and world pops off the screen whether in story moments, exploring or in battle. Whether in handheld or docked, the world’s consistent visual style really brings everything together in this experience and it’s a treat to look at if you’re a fan of other stylish games like Persona, complete with a ridiculously cool soundtrack. 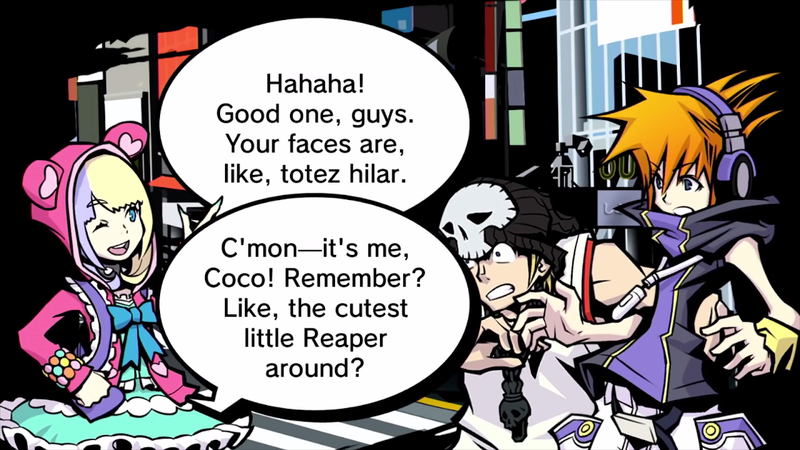 The World Ends With You also features minimal voice acting, which I surprisingly ended up liking a lot thanks to how well the dialogue for each character and scene is written. The characters speak just as colourfully as the world they’re placed in, with the cast being teenagers meaning plenty of slang and abbreviations in their speech that make them come to life and the emotional growth of each one makes sure to mix in humour into its quirky dialogue that made them all likable in some sense. As it was my first time playing The World Ends With You, its outlandish characters in its story and the overall feeling of world made me love this story in general. The characters aren’t afraid to throw attitude and express themselves and are refreshingly candid about all the story events as they play out. The way The World Ends With You presents deeper concepts while also not taking itself too seriously made it easy to connect with and partnered with everything else in audio, script and visuals to bring everything together, I enjoyed playing with this cast in this version of Shibuya and understanding why this game was so beloved on DS in the first place. Style also extends into the battle system, which stands out when compared to other JRPGs thanks to the way it uses different control styles. Attacks are done by either tapping or making different motions with a cursor, which is done by either using the touchscreen or the motion control with just one of the joycons, with the use of two joycons being saved for when playing Co-Op with a friend. There are a few different styles of attacks that can be done with different attack Pins, such as dragging empty space to use most elemental pins, swiping the screen in a slashing motion to hit enemies in different ways and also hurling obstacles at enemies by picking them up and dragging them. The active system as has its own special attack system as well in the form of a fast card tapping sequence that changes depending on who Neku is fighting with at the time that requires some fast tapping to get the best damage multiplier and I had a lot of fun with the combination of the regular battle flow and the fast-paced special attacks keeping battles interesting in its own unique system. As for the controls, since there’s a choice between playing with one joycon or using the touchscreen, it is quite different to other JRPGs I play with a controller. I started off trying to use both joycons as usual, but then realised the game was only using one, so I then played with the joycon and wrist attachment for my first 10 hours while I was getting footage and found it surprisingly enjoyable after a few hours of getting used to things. Dragging fire onto enemies while pointing with the joycon was an interesting new experience and I liked how the pointer could be adjusted so that I could play with my wrist at any angle. It isn’t without problems though - I specifically avoided using slash pins as the pointer doesn’t give the right amount of precision to use these well and this became particularly hard when playing with character’s like Joshua whose sole special attack relies on being built up with this kind of attack. After my 10 hours I switched to touchscreen and found it much, much better and think this is how The World Ends With You should be played on Switch. With finger tapping, getting combos in is as fast as is needed to get a good multiplier going and I could finally use all my pins properly for every dragging, slashing and tapping pin I needed and wanted to use and although I didn’t hate the other method, it was generally a better fit for anything fast needed to be done in its active system. So with that in mind, while docked isn’t completely unplayable if you use the right pins, the handheld mode gives the precision needed to play the harder battles and was much more fun in this unique battle system and with my joycons off the console playing in tablet mode, I was able to enjoy swiping enemies and tapping in special attacks at home and on the go and had no issues with the control scheme going forward. Pins are the beginning of some of the interesting systems in The World Ends With You and I really enjoyed discovering these and the way they customise the game for the first time in Final Remix, along with the extra content included in this edition. 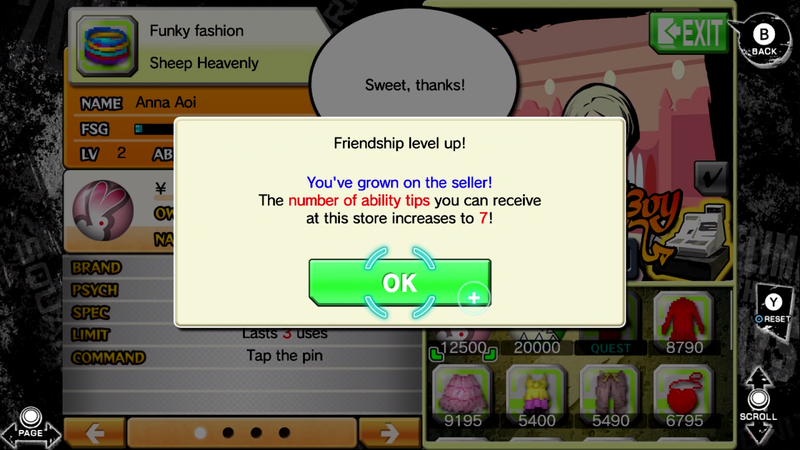 The Pin system serves as a unique skill system for battles as well as a great collectible with over 300 pins to collect in total through finding them in stores, evolving them, in the story or in battles. 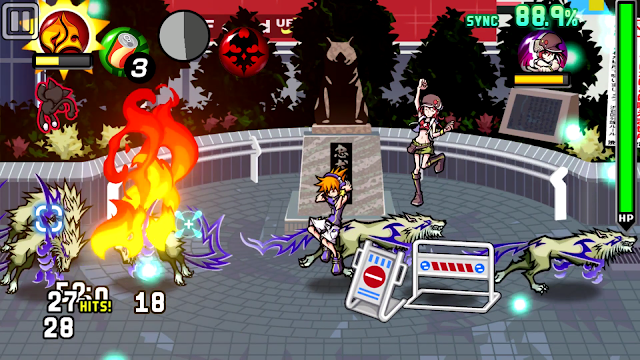 Battle difficulty includes its own level of customisation for gaining goods or making things more challenging thanks to being able to change the difficulty mode along with Neku’s current level, with the level changes also resulting in better drops if you put the level low enough and was a fun way to try get different games for Reaper quests and otherwise. Shops also have a leveling up system, with some item abilities being locked until you become friendly with the staff and there are other systems such as feeding characters, giving them clothing and affecting brand ranks in town with what you wear and use that made customisations available in almost every part of the experience and it was fun to play with these both at my leisure and for different story quests that played with these. Although the main story campaign including new content was around 20 hours long, with all these different systems of collectibles and new ways to try playing, I’m sure there’s plenty more I could do the next time I explore its world. 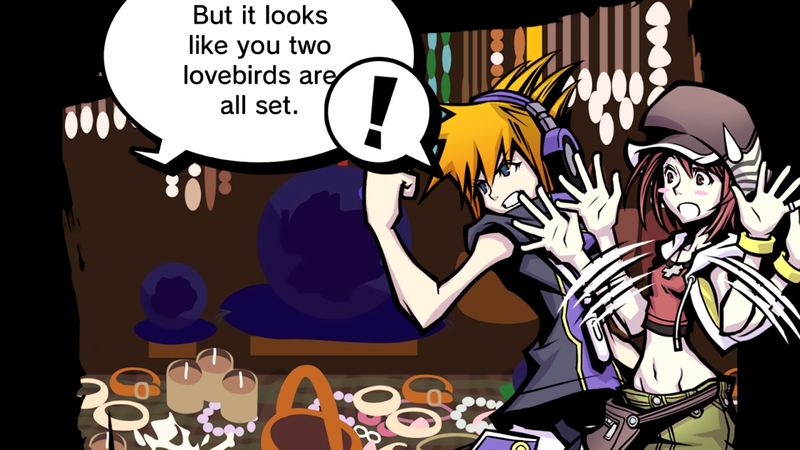 And for players who want more time with the game or those who have already played The World Ends With You and want something new, the post game of Final Remix is important as it features the new story episode ‘A New Day’. A New Day is an extra mystery featuring a cute-looking new character Coco that added extra battles to the combat system while showing off the fun characters I grew to love in the main story again that left me hoping we see more of this game and series someday. The extra content doesn’t really add anything crazy to the main story other than some more fun gameplay, but as a new player of the series it was a nice small experience to leave me excited for more and with its enjoyable story and cool looking world is something I hope we see more of sometime. 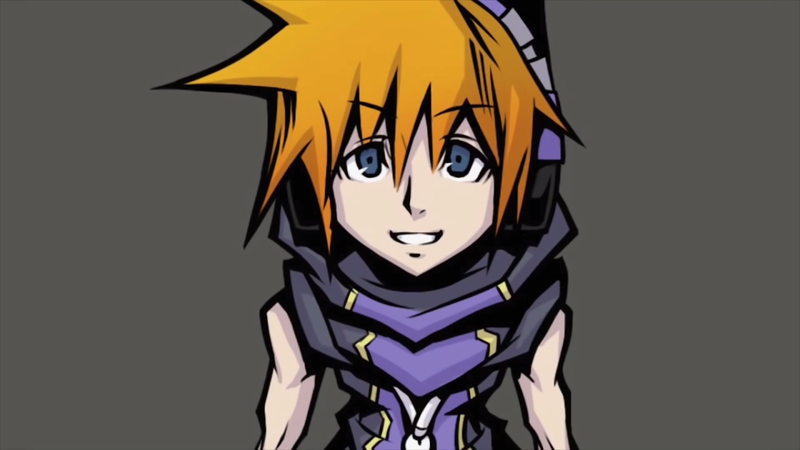 As a DS Classic on Switch, with a modern feeling story and stylish world, The World Ends With You -Final Remix- made its gameplay and characters feel fresh, fun and new in its unique and cool world. The touch mechanics were a new way to use my Switch and if you can get past the different control style, its pin system and others are worth diving into with the way it lets you customise playing in its colourful world. This stylish game full of sights and characters that pop off the screen and had me engaged in their growth throughout the story is clearly a DS favourite for a reason now that I’ve played it and if you’re like me and had been putting off trying it until this Switch release, I think its mysterious version of Shibuya is well worth trying if you think it looks interesting and don’t mind playing it undocked. Controls aren't perfect, but if you enjoy touch mechanics in other games this is definitely worth playing if you like the look of it! You can pick up The World Ends With You Final Remix on Amazon! Will you pick up The World Ends With You Final Remix? If you did, what did you think of it?